As teacher strikes swept across the country this year, union leaders in many cities painted charter schools as the enemy. But the narrative that pits charter schools against unions largely ignores the fact that district teachers aren’t the only ones walking off the job; charter school teachers in Chicago and Los Angeles went on strike earlier this year, too. These labor disputes are worth watching. They test whether the unlikely pairing of teachers unions and charter schools can lead to a new model for labor relations in public education — or, instead, will reinforce divisions between the two movements. Leaders of teachers unions and charter schools have long battled each other. American Federation of Teachers President Randi Weingarten recently said the two camps are locked in a “gladiator fight” over the future of public education. Our research demonstrates that the reality is more complicated. We recently interviewed teachers at nine unionized charter schools across the country. They didn’t frame their demands in terms of the larger, protracted conflict playing out between unions and charters. District or charter, teachers want the same things: capable administrators, opportunities for influence, fair pay and reasonable working conditions. Collective bargaining in charter schools remains rare. The rate of unionized charters has declined slightly over the past decade, but data from the National Alliance for Public Charter Schools show union organizers making inroads with teachers in some states and localities. In Illinois, for example, the unionization rate had surged to more than 20 percent in the 2016-17 school year from 10 percent in 2009-10. The Chicago Teachers Union now represents educators at more than one-quarter of the city’s charter schools. Charter school supporters rightly view these efforts with suspicion. The union has opposed charters, including writing a moratorium on charter growth into its contract with Chicago Public Schools. How this plays out hinges on whether unions and charter school leaders can come together around a shared mission in the service of students. Teachers striking in Chicago wanted higher salaries and adequate support staff. Administrators argued that the schools must live within their means and cannot afford to meet all the union’s demands. Both sides have a point. Charter schools cannot support unsustainable financial commitments without risking closure; they cannot raise taxes to increase funding, as districts do. But they can thrive only if their teachers are treated, and paid, like professionals. What’s the way out of this dilemma? Our research suggests collective bargaining can’t, on its own, address the issues of mistrust that frame labor disputes. 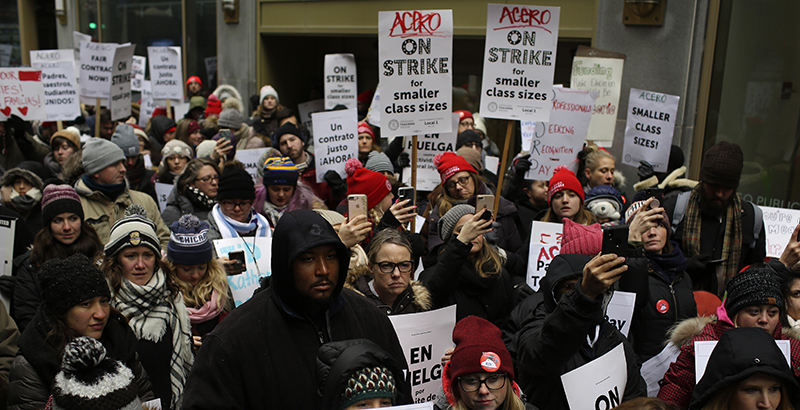 While strikes might increase charter teachers’ leverage over administrators, they don’t provide a foundation for a collaborative working relationship — grounded in a common understanding about available resources and how teachers and administrators can best serve students. Teachers and administrators in unionized charter schools have an opportunity to show that unionization can benefit teachers and kids. But this can’t happen in an antagonistic climate. It depends on labor and management recognizing their shared mission in service of students. Ashley Jochim is a senior research analyst with the Center on Reinventing Public Education at the University of Washington Bothell. Lesley Lavery is an associate professor of political science at Macalester College in St. Paul, Minnesota. Lesley Lavery is an associate professor of political science at Macalester College in St. Paul, Minn.